Dardenne Prairie real estate is made up primarily of newer homes with an average home age of 12 years. Homes for sale in Dardenne Prairie MO range in price from $100,000 to $650,000. The median home price in 2014 was approximately $300,000. Dardenne Prairie is primarily residential with the majority of businesses located in adjacent cities. The residents enjoy three local parks. Georgetown Park is just over 1/3 acre and is home to fallen soldiers on both sides of the civil war. Barathaven Park is over 90 acres and includes 3 miles of trails recreation fields and a 15 acre lake. The Dardenne Prairie City Hall Park is home to the “Spray Ground Play Ground” and is a popular park on hot summer days. Dardenne Prairie properties are served by three school districts; Fort Zumwalt West, Liberty High School and Francis Howell. See Great Schools for up to date ranking on every school in the area. If you are looking for a home for sale in Dardenne Prairie MO or you would be interested in buying a home in Dardenne Prairie, please contact St. Charles real estate expert, Sharon Colona and St. Louis Realty for a professional and simple buying or selling process. Call (636) 397-7653 or email at scolona@stlouisrealty.net. Value is in the land. To be sold with property located at 7467 Highway N O'Fallon, MO 63368. ML# 17009429. NOT TO BE SOLD SEPARATE. xD; xA;Seller is selling AS-IS. Seller makes no representations or warranties of any kind and buyer accepts the property in its AS-IS WHERE-IS condition with all faults. This Colorado inspired Ranch dream home is situated on a 0.49 acre lot in an enclave of exclusive homes in the Summit at Barathaven. Biking, hiking trails, a 15-acre lake & prairie fields are all just steps from your front door. Located in Francis Howell school dist & John Weldon elem. It x2019;s all about the details, from the rustic barn door in the entry way, 9 & 10 ft ceilings on the main floor, craftsman style dining rm & plantation shutters. Gourmet-style kitchen w/ huge center island, gas range, designer hood, tile backsplash, granite counters & breakfast rm. Main flr master bedroom suite offers French doors leading to back patio, gorgeous bath w/ a double bowl vanity, shiplap accents, a 7x5 river rock tiled walk-in shower w/ dual shower heads & jaw dropping tub. Three addl' bdrms, full bath, laundry & great rm complete the main level. The LL has a rec rm area, barnwood accent wall & the rest is unfinished. Lush landscaping, a custom stone fire pit & bar area awaits you outside! Gorgeous Newer Construction offering 5 Bedrooms, 3 xBD; Baths & a 3 Car Garage! This home has Over 3800 sq. ft. of Living Space plus a fabulous finished Lower Level! Highlights Include: Spacious eat in Kitchen with updated Appliances, Custom Cabinets, Tile Back splash, Breakfast Room & Wood Flooring! Main Floor Laundry! Hearth Room off Kitchen with Stone Fireplace! Crown Molding added to Dining Rm., Entry & Main Floor Powder Rm. Second floor loft! Beautiful Master Suite with Updated Master Bath featuring Quartz Tops, His & Her vanities, Updated fixtures & Custom Closet. Awesome Lower Level with 9 x2019; plus ceilings, Family room, Custom Bar with Dishwasher & Wine Fridge, Full Bath, Workout room, extra Bedroom for guests & plenty of storage space! 4 exterior cameras for security on the exterior! Relax and enjoy your Custom Patio with Fire pit, Lighting and Outdoor Speakers! Too many upgrades to list! See attached list over $70,000+ in upgrades! Must see! This meticulously maintained split bedroom ranch sits on a premium water front lot at Leighton Hollow and is built for entertaining. Located on a quiet cul-de-sac. Full brick/stone front. 3-car garage with carriage style doors. Large dining room and an office off the entry foyer. Great room with gas fireplace and 12' ceiling with wall of windows and lake view. 9' ceilings throughout the remainder. Fantastic kitchen with center island, 42 cabinets w/crown, granite countertops & tile backsplash. Cozy hearth room w/wood burning fireplace. Exit the breakfast room and relax on the 32 x 16 composite deck overlooking the lake. Hardwood flooring throughout the main living areas. Deep pour lower level with walkout to a huge exposed aggregate patio. In-ground sprinkler with lush landscaping & lawn! High-Efficiency HVAC. Outstanding location close to shopping and quick access to Hwy 40/61. This one-owner home is in absolute pristine condition and is loaded with extras! Don't Delay! WOW! If you are looking for an AWESOME 4 bedrm home w side entry 3 car garage, look no more! This 1 1/2 story charmer sits on a nice size corner lot with much curb appeal. Stately brick /siding exterior. Lights in the soffits create an ambiance that shows off the tasteful landscape. The open foyer welcomes all who enter. Den to the rt, din rm on the left, both painted in designer colors. Notice the gorgeous wood floors . Master bedrm, den, din rm,and liv rm have neutral carpet. ALL baths have heated custom tiled floors. Great rm is large with lots of room for entertaining w a gas fireplace and wall of windows. Spacious bright and cheery kitchen, 42'cabinets, elect cooktop,built in oven, center island, granite countertops, deep farm sink. French doors to the 31x28 cobblestone patio. Hearth rm off the kit. is great for family gatherings. T staircase to upstairs w 3 lg bedrooms and HUGE BONUS Room. Balcony overlooks Great Rm. Gas/Elec hookups for laundry.Egress 9'pour extra breaker box. Awesome Location! Extraordinary Value! 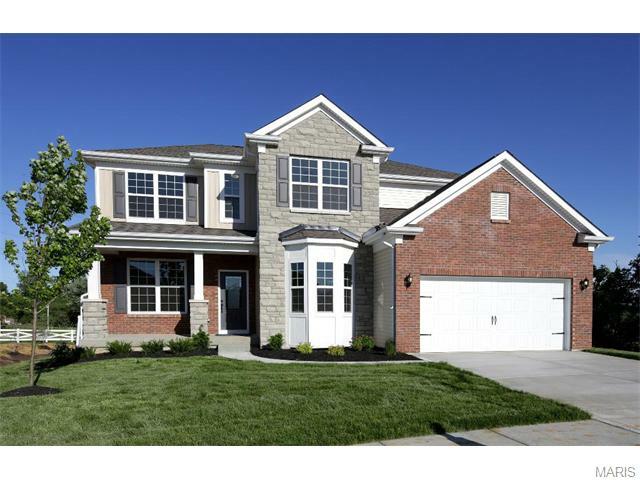 Decorated like a display, this elegant 2 sty home w/side entry garage conveniently located in desirable Francis Howell SD! Step into the inviting 2 sty foyer w/Palladian window and gleaming hardwood floor, you will discover quality, class w/amazing level of livability. 9ft ceiling on main floor w/ bay windows & plantation shutters offers lots of natural light. T staircase, new carpet, irrigation system, over-sized patio with a private & peaceful backyard. Fabulous Gourmet kitchen w/ SS appliances, center island w/bar, granite counters & spacious dining area, open to cozy hearth rm w/ fireplace. 2nd floor offers master suite, walk-in closets, luxury bath w/separate tub & shower, plus 3 spacious bedrooms. Updated bathrooms, new carpeting, newer HVAC & roof, updated landscaping; too many upgrades to mention. Westfield Woods has its own sports fields and pavilion, not to mention in walking distance to fishing & trails. Come see this executive home! Huge Price Reduction!!! Beautiful spacious 4 bed & 3.5 bath 2 story house in sought after Laurel Gen community. Tons of upgrades, first floor with 9 ft ceiling; gorgeous wood floor in entry foyer, living, dining, family, breakfast room and kitchen; window wall, gas fireplace and ceiling fan in family room; breakfast room with bay window; 42 custom staggered cabinets with crown molding, granite countertop, center island with breakfast bar, butlers pantry, oversize walk in pantry, stainless steel appliances and backsplash in kitchen; an office/computer room off kitchen; main floor laundry. You will be welcome by a large loft/flex room upstairs. Master bedroom with a huge walk in closet, luxury bath with double vanities, separate tub and shower. 2nd bedroom with its own bathroom and walk in closet. 3rd and 4th bedroom with Jack & Jill bathroom. Fenced backyard and sprinkler systems, patio and 3 car garage. Move in ready. Stunning 1.5 story home brilliantly appointed throughout situated on a lovely level lot backing to trees! Roof 2016, HVAC 2016, HWH 2015, Irrigation system, MF laundry, rough in bath in LL. Walk into the large foyer opening to the dramatic great room with WB fireplace, soaring ceilings and staircase! The kitchen boasts 42 inch cabinets, granite countertops, gas stove and breakfast room w/ plantation shutters. There is a powder room, living room and dining room. The private master bedroom suite is complete with Master bath, soaking tub, shower, huge walk in closet and access to the covered patio. The bedrooms are all spacious and feature walk in closets! There are three bedrooms on the 2nd floor, 2 share a Jack n Jill bath and the other has a private full bath. A spacious loft that is so tranquil! Enjoy the covered patio in the back yard which is designed for entertaining, relaxing & enjoying the views! The 3 car garage is heated & insulated. This is the home you have been waiting for! Painted, polished and ready for today x2019;s buyer! Showcases a well-designed kitchen/breakfast rm w/42 x201D; cabinets, granite countertops, tiled backsplash, stainless steel appliances, hardwood flooring & planning desk. This home is ready to accommodate any sized family inside or out w/its formal Liv/Din Rm OR step out to its deck offering the perfect setting for outdoor entertaining. Bright & Open Great Room w/brick fireplace and newer flooring. Upstairs you x2019;ll find Master Ste w/luxury bath x2013; double sinks, ceramic flooring, corner soaking tub & sep shower. Secondary bedrooms are nicely sized with newly installed carpet. Bdrms 2&3 share a Jack N Jill bath and bdrm # 4 has its own private bath. PLUS, the loft is the perfect place for some R&R! This home has it all x2013; possible 5th bdrm in the LL, newer lighting, MFL, HSA Home Warranty, zoned HVAC, 9 x2019; ceilings and so much more. Conveniently located just minutes from shopping, hwys & dining. Call today! ORIGINAL OWNERS/AGENT OWNED home have enjoyed caring for this wonderful 2 story home! xD; xA; xD; xA;PROFESSIONALLY PAINTED THROUGHOUT & MOVE IN READY! xD; xA; xD; xA;Numerous Improvements include, New ROOF 7/18, New FURNACE/AC 10/18, New CARPETING in 3 Bedrooms 11/18, New GARBAGE DISPOSAL 3/19, GRANITE in Kitchen, & ALL Bathrooms, 3/4 SOLID HARWOOD FLOORING throughout MAIN LEVEL, MASTER BEDROOM/MASTER CLOSET, & HALLWAY. CROWN MOLDING in all rooms on main level, FULLY FENCED BACK YARD w/Trees landscaped along back, & sides, SunTEK WINDOW FILM installed on all windows for energy efficiency/block harmful rays, Accent/Security Landscape Lighting & Inground water sprinkler system. xD; xA; xD; xA;Generously sized beautiful fenced back yard that's perfect for kids/entertaining guests, or possibly a pool install in the future! xD; xA;Don't wait too long to come view this home! Welcome HOME to this STUNNING 4 bed, 4 bath 4,600 sq ft well- maintained home in a beautiful Dardenne Prairie neighborhood. This home offers an immense number of upgrades. Walk into an oversized entry foyer, your eyes will be drawn to hardwood floors, & an open floor plan. There is a spacious family room with french doors to your left, dining room to the right, a very large family room w/ a gas fireplace & bay window with a wide stair case leading upstairs & down. Main floor also offers a half bath & a butler x2019;s pantry off the dining room. The UPDATED KITCHEN offers NEW GRANITE COUNTERTOPS & NEW LUXURY VINYL, an oversized walk in pantry, & an additional room that could be utilized as a mudroom or anything your needs require. The upstairs offers new carpet, a roomy loft, 3 bedrooms with walk-in closets, a MASSIVE MASTER SUITE with an enormous walk in closet, and a spacious master bath. The newly finished LL features plenty of storage space & a gorgeous full bath. COME SEE YOUR NEW HOME! Low Maintenance, Carefree living by Payne Family Homes! Enjoy exceptional luxury, top selling features & extraordinary finishes in this 1,746 s/f home in Cordoba, an intimate community of 51 detached villas w/abundant common ground, a small private lake w/fountain, walking trail & a community park. The curb appeal is exquisite w/brick-stone, coach lights, arch shingles, prof landscape, full yard sod & lawn irrig. Enjoy 2 BD (plus a Den/Study), 2 BA, 9 x2019; clngs, an open flr plan, gas FP, wood laminate flooring, wr iron stair balusters, Deluxe Kit, 42 x201D; cab w/hardware, an oversized island, Quartz c-tops, st steel appl, tile b-splash, gas range, transom windows in the Caf xE9;, dbl bowl vanity in the Mstr Bath, marble shower w/seat in the Mstr, wave bowls in both baths, 50 gal water htr, Jeld Wen Low E windows, cust wall paint, garage door opener, upgraded carpet & pad in the bdrms & low profile LED clng lights. There is easy access to Hwys 364, I-70, 40/61, shopping, recreation & restaurants. NEW CONSTRUCTION by Payne Family Homes! Enjoy carefree living, exceptional luxury and extraordinary features in this 1,758 sq ft villa in Cordoba, an intimate community of 51 detached villas with abundant common ground, a small private lake with a fountain, walking trail and a community park. The curb appeal is fantastic with brick & stone, a 3 car garage, coach lights, arch shingles, prof landscape, full yard sod & a maintained lawn irrig system. Enjoy 3 BD, 2 BA, an open floor plan, 9 x2019; ceilings, a dynamic Kitchen, 42 x201D; cabinets w/crown, cabinet hardware, gas FP, Quartz countertops, tile backsplash, under cabinet lighting, a large island, brkfst bar, st steel appliances, wood laminate flooring throughout the main living areas, Jeld Wen Low E windows, raised height bath vanities, walk-in closet in the Mstr, main floor laundry, garage door opener and more. There is easy access to Hwys 364 & 40, shopping, recreation & restaurants. Cordoba has raised the bar on luxury, low maint living! Fall in Love with the OPEN Concept offers HUGE Granite Island with Stone Exterior and Stone Faced Gas Fireplace in Great Room enhanced by Wood Floors in the Main Living space. Gourmet Kitchen offers all Stainless Steel Appliances with Double Oven Gas Stove plus Built-in Microwave, Walk-In Pantry with Auto Lighting and Glass Patio Door leads to the Covered Patio. Main Floor Laundry Room and Decorative Iron Spindles on the Railings to the lower level. Spacious Main Floor Master Suite features Barn Wood Wall & Trey Ceiling w/Recessed Lighting and Glass Door Opens to the Covered Patio. Master Bath with Ceramic Tile floor, Separate Adult Height Vanities, Soaking Tub & Separate Shower. Over-Sized Master Closet. 2 Additional bedrooms and 2nd Bathroom w/Ceramic Tile floor. Upgraded Glass Front Door with Sidelights and Transom Window. Custom Window Treatments all Windows. GIANT 3 car Garage with Epoxy Flooring & Service Door & Brick Mailbox! Egress Window & Rough-in for Bath. 2 Years New! BIG Price Change! Don't Miss this Deal! WELCOME Home to this spacious 2600+ Sq. Ft. Washington Model Home in the Villages of Dardenne, with a Golf Course view! Open floor plan with a T- Staircase. Great Room has 2 built-in bookcases along with a Triple Bay Window. Pocket Doors separate Living/Den/Office from the Great Room. Kitchen has 42 Cabinets and a planning Desk. Ceramic Tile through the Kitchen, Breakfast Room and Laundry Room. Large 21x12 Deck off of the Breakfast Room to enjoy your morning coffee. Upstairs has 4 spacious bedrooms and a nice bright loft with a skylight. Double doors lead into the Master Bedroom with vaulted ceilings. Double Sinks in the Master Bath, separate Shower & Jetted Corner Tub. The 3 other bedrooms have 2 closets in each room. Walkout lower level is ready for you to finish! Large 37x16 Patio with Retaining Wall & nice landscaping leads out to a nice level yard. NEW CONSTRUCTION by Payne Family Homes! Enjoy carefree living, exceptional luxury and extraordinary features and finishes in this 1,615 s/f villa in Cordoba, an intimate community of 51 detached villas with abundant common ground, a small private lake with a fountain, walking trail and a community park. The curb appeal is fantastic w/stone, vertical siding, coach lights, arch shingles, prof landscape, full yard sod & a maintained lawn irrig system. Enjoy 3 BD, 2 BA, an open floor plan, 9 x2019; ceilings, a center Kitchen, 42 x201D; cabinets w/crown and hardware, gas FP, Granite countertops, tile backsplash, under cab lighting, brkfst bar, st steel appl, wood laminate flooring throughout the main living areas, Jeld Wen Low E windows, raised height bath vanity in the Master, walk-in closet in the Master, main floor laundry, garage door opener and so much more. There is easy access to Hwys 364 and 40, shopping, recreation & restaurants. Cordoba has raised the bar on luxury, low maintenance living!